Rivers state deputy governor, His Excellency, Engr. 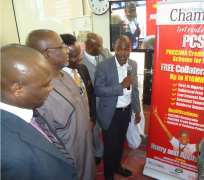 Tele Ikuru has lauded Port Harcourt Chamber of Commerce, Industry, Mines and Agriculture, PHCCIMA for introducing a collateral free Credit Support Scheme for SME's, otherwise known as PCS3. Ikuru made this commendation last Wednesday while formally launching the PCS3 initiative during PHCCIMA monthly council meeting held at the council hall in Port Harcourt. He said the scheme is unique and dynamic, presenting better prospects for SME's to develop unlike the bottlenecks and complications experienced while sourcing from other financial avenues. The Rivers number two citizen who was represented by the Special Adviser to the Governor on fishery, Mr. Alapuye Cotterel disclosed that the state government places a lot of priority in stimulating and making policies that can improve businesses in the state, even as it was instrumental to the Governor Chibuike Rotimi Amaechi led government decision to earmark N5 billion naira for the development of entrepreneurship in the state. He urged other financial institutions to emulate the PHCCIMA example with a view to moving our SME's forward. In his remark President of PHCCIMA, Engr. Emeka Unachukwu said the PHCCIMA model PCS3 is not just a milestone in its easy access to fund but the zero collateral is calculated boost for SME's. He said the initiative was developed to help address one of the fundamental challenges encountered in access to funding. 'Funding has become extremely difficult to obtain for the Small and Medium Scale Enterprises (SME) due to less access to funds and extreme challenges in meeting up with stringent requirement when available' he averred, regretting that commercial banks and conventional funding avenues have proven to be too demanding and at astronomically high interest rates which is expected at very short terms with impossible pre-requisites. 'Our primary objective as a chamber of commerce since inception has been to provide support, advantage and welfare for its member organizations hence, we had to devised this new and ingenious way of organizing such a facility for the benefit of our members'. Unachukwu explained that PHCCIMA has designed a structured credit scheme which will allow member companies and organization access to good volume of funding of low interest and relatively long term, adding that the structured sourcing, administrative management, pre-qualification, oversight and monitoring of the funds will all be carried out using the elaborate internal mechanisms of PHCCIMA PCS3. The scheme said to be powered by Grofin Finance and Midland Microfinance Bank Limited is aimed at providing PHCCIMA members access to quality, low interest, medium to long term funding, means of accessing funds with only necessary and low encumbrances as a prerequisite to qualification of funding which requires NO COLLATERAL. In addition he said the PCS3 will provide business support services along with the funding such as; Financial training, Administrative training, Professional (Project Specific) Training, Accounting intervention services which in turn provide PHCCIMA members cost effective means of fund allocation with broad contact database'. Said PCS3 will set up an elaborate monitoring system to monitor fund utilization by member companies. This according to him will aid greatly towards repayment and ensuring that funds are used for what they were applied for. He said PHCCIMA has a very elaborate and detailed means of establishing who is regarded as a member. Consequently, only members who are formally registered will have a complete and detailed information database (updated) and issued with the PHCCIMA identification card. This he said will be placed on a prepaid VISA debit card. 'They will also have to be certified as financially up to date member. The database allows for accurate identification and starting point for assessment - each member is issued a unique PHCCIMA number which gives them access to privileges through PHCCIMA'. He said it is PHCCIMA's little way of assisting SME' who constitute 80% of enterprise in the country to stimulate our economy and create job opportunities. Dignitaries at the event include; RSSDA MD/CEO, Mr. Noble Pepple, representative of Comm. for LG, immediate past PHCCIMA president, Dr. Vincent Furo, 3 former presidents, Elder Hyke Ochia, Prince Billy Gillis Harry and Godfrey Ohuabunwa including representative of the Comm. for Commerce among others.